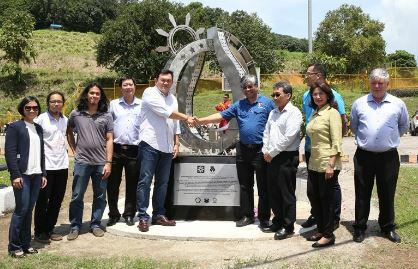 Marking Malampaya Deep Water-Gas-to-Power Project’s successful completion of the first Filipino-built offshore platform, the Malampaya Consortium unveiled a sculpture at the Keppel Subic Shipyard in Zambales last September 2. MALAMPAYA MARKER UNVEILED Officials from the Philippine Economic Zone Authority (PEZA), Shell Philippines Exploration B.V. (SPEX), Philippine National Oil Company-Exploration Corporation (PNOC-EC), and Chevron Malampaya LLC grace the unveiling of the Malampaya Phase 3 Project sculpture at the Keppel Shipyard in Subic, Zambales. Leading the inauguration are PEZA Area Manager Idelmira Pestio, SPEX Asset Manager Sebastian Quiniones Jr., PNOC-EC Vice President for Upstream Operations Raymundo Savella, Chevron Malampaya Asset Manager Belinda Racela, Keppel Philippines Marine Inc. President Leong Kok Weng, and Keppel Shipyard Ltd. Managing Director Chor How Jat. The sculpture, put together by the winning artists of the Shell National Students’ Art Competition, spotlights on the latest phase of the Malampaya Gas Project. Artists Melvin Anglacer, Carlo De Laza, and Francis Bejar recreated the Malampaya flame using scrap materials from the construction of the MP3 Depletion Compression Platform (DCP), the first offshore platform designed and built in the Philippines. 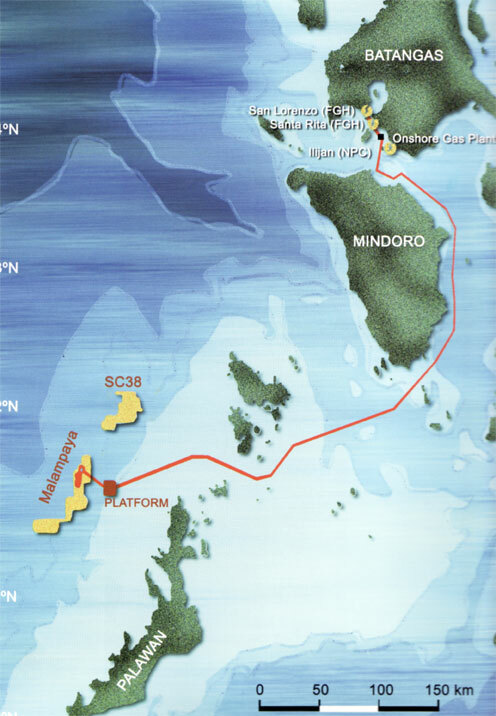 The Malampaya Consortium, led by Shell Philippines Exploration, together with the Department of Energy, ensured the successful delivery of the new platform in February last year. The platform was constructed by the men and women of Keppel Subic for just over a period of two years, generating more than 1,400 new jobs for Filipino workers. Through the detailed measures for safety implemented by operator SPEX, the undertaking was completed on time and according to plan with an impressive record of over 11.8 million safe man hours. HISTORIC UNVEILING Shell’s Sebastian Quiniones, Jr., and Keppel’s Chor How Jat lead the unveiling of the new Malampaya Phase 3 Project sculpture at the Keppel Shipyard in Subic, Zambales. With them are (left-right) SPEX Managing Director Lorelie Osial, Shell National Students’ Art Competition artists Melvin Anglacer and Carlo De Laza, Keppel Philippines Marine Inc. President Leong Kok Weng, Philippine National Oil Company-Exploration Corporation (PNOC-EC) Vice President for Upstream Operations Raymundo Savella, incoming SPEX Asset Manager Don Paulino, Chevron Malampaya LLC Asset Manager Belinda Racela, and SPEX Malampaya Phase 2&3 Project Manager Antoine Bliek. Malampaya continues to be one of the greatest industrial undertakings in the history of the Philippines. A source of energy, a source of national pride, the new Malampaya platform was made by Filipinos, for Filipinos.